Card is MINT. Card is #RJ-ZB and is #29 of 299. A great card to add to your collection. Sorry, no exceptions. Card is MINT. Card is #RJ-ZB and is #165 of 299. A great card to add to your collection. Sorry, no exceptions. You are purchasing a complete Master team set of Atlanta Thrashers from the 2008-09 Upper Deck MVP Hockey set. The complete team set includes short-printed rookie cards from the entire 392-card regular set, and First Line Phenoms (FL), Magnificent 7’s (M7), Marked by Valor (MV) and Alexander the GR8 (AO) inert cards where applicable. 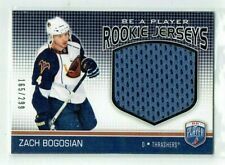 Up for sale is a 2008-09 Zach Bogosian Upper Deck Black Diamond Quad Rookie #190. Up for auction is a Zach Bogosian autographed Printing Plate (MAS-163) Black Plate. Great looking card!!! Shipping in USA is $6 (includes Insurance & tracking) International shipping is based on location. Check estimate shipping costs provided by ebay/usps for this item. Canada is around $11-$12. (I require tracking. If tracking isn’t included, it will be extra. Tracking should be Included for free, but I just want to be clear im case some European countries don’t get tracking included for this service level). Ships in Top Loader case with penny sleeve (as shown in Photo), wrapped securely, in padded envelope.